The Global Volcanism Program has no Bulletin Reports available for Brava. The Global Volcanism Program has no synonyms or subfeatures listed for Brava. 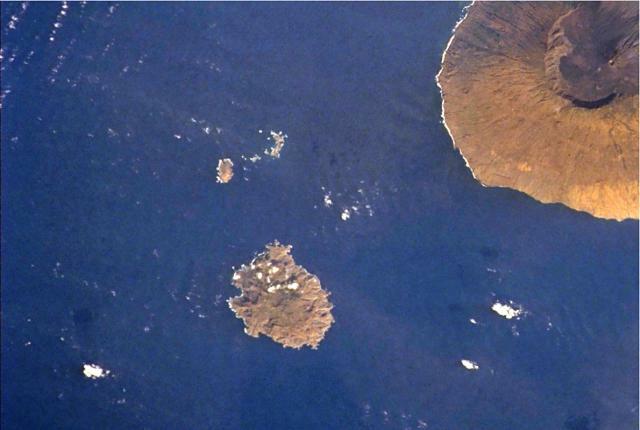 Brava Island, 20 km W of Fogo, is the westernmost of the southern Cape Verde islands. The 10-km-wide island contains 15 morphologically youthful craters located along two or three lineaments intersecting along the crest of the island. The youthfulness of the craters and numerous minor earthquakes in recent years indicate that a significant volcanic hazard still exists (Wolff and Turbeville, 1985). Most of the younger eruptions originated from the interaction of phonolitic magmas with a large groundwater reservoir contained within an older volcanic series characterized by thick welded ignimbrites and block-and-ash flow deposits. Carbonatitic lavas are also found. Wolff J A, Turbeville B N, 1985. Recent pyroclastic deposits on Brava, Cape Verde Islands (abs). Eos, Trans Amer Geophys Union, 66: 1152. The Global Volcanism Program is not aware of any Holocene eruptions from Brava. If this volcano has had large eruptions (VEI >= 4) prior to 10,000 years ago, information might be found on the Brava page in the LaMEVE (Large Magnitude Explosive Volcanic Eruptions) database, a part of the Volcano Global Risk Identification and Analysis Project (VOGRIPA). There is no Deformation History data available for Brava. There is no Emissions History data available for Brava. Small craters are visible on Brava Island (lower center), located across a channel 20 km west of Fogo (upper right). Brava is the westernmost of the southern Cape Verde Islands. Brava contains 15 morphologically youthful craters that were constructed along two or three lineaments intersecting along the crest of the 10-km-wide island. The small islets of Ilheus Secos lie north and NE of Brava. The large summit caldera of Fogo is visible at the extreme upper right. NASA Space Shuttle image STS108-713-47, 2001 (http://eol.jsc.nasa.gov/). The Global Volcanism Program has no maps available for Brava. There are no samples for Brava in the Smithsonian's NMNH Department of Mineral Sciences Rock and Ore collection. Large Eruptions of Brava Information about large Quaternary eruptions (VEI >= 4) is cataloged in the Large Magnitude Explosive Volcanic Eruptions (LaMEVE) database of the Volcano Global Risk Identification and Analysis Project (VOGRIPA).